The symptoms of blood circulation problems may have several different causes. Most often causes are the thickening and hardening of the arteries and the peripheral arterial disease. Nowadays, poor blood circulation appears to thrive. Especially among the young people. This comes as a surprise because it was believed that poor blood circulation is a condition typical for older people. Young people often develop the unhealthy eating habits and the lack of any physical activity. This plays a key role in the appearance of the blood circulation problems. Here are 10 signs that you may suffer from poor blood circulation. 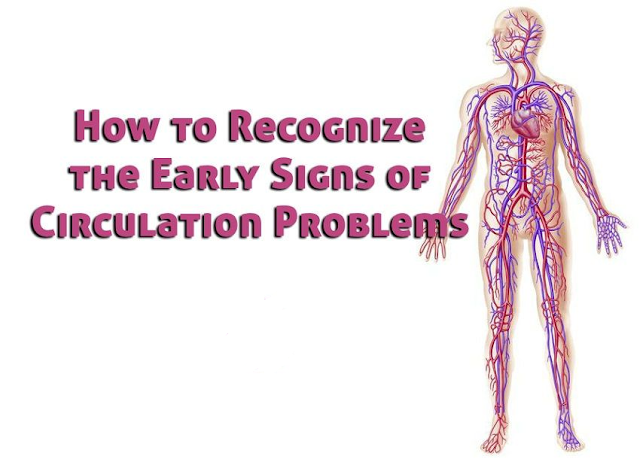 A common symptom of poor circulation is a pain in the legs. It appears as muscle cramps or pain in the hip when you are walking, climbing stairs or running. This is a condition called intermittent claudication and it’s a sign of peripheral arterial disease. If you feel numbness or weakness in hands or in your feet while you’re active or at rest, then you may have poor blood circulation. If these symptoms come suddenly and if they are accompanied by a difficulty to speak or weakness in the muscles of the face, you may have poor blood circulation in the brain. Poor circulation in the arteries which are supplying the brain with blood can cause a stroke. If you feel your hands or your legs cold all the time without any apparent reason, this may be also a poor blood circulation sign. Circulation problems can produce coldness in the hands or feet. You may also notice that your limbs are swelled due to poor circulation, especially your legs. Another poor circulation sign, especially in the legs, is the presence of wounds on the feet that do not seem to heal. You may also notice infections on your feet which seem to last forever. Poor circulation can cause changes in skin color in the hands and feet. If you notice that your skin looks blue this is because the blood does not carry oxygen properly in your limbs. Poor blood circulation can be caused by atherosclerosis. This condition makes your pulse weak in your feet. When the pulse is absent or weak, it means that there is not or there is little blood flow to these areas of your body. The most common method used by physicians to control the problem of blood flow is to check the pulse in your leg or groyne. If you feel chest pain or angina, as well as other heart attack symptoms, you may have poor blood circulation in the arteries around your heart. In this case, you should see your doctor immediately to prevent a potentially life-threatening problem. Ulcers are certain points of the skin which are causing inflammation and where a rash is generated. Somebody with blood circulation problems can notice these inflammations to start growing on their feet. Look for dry, red spots of different sizes on the skin. The valves of the heart are pumping blood. If they are not working properly, then the blood accumulates in the legs and increases the pressure on small blood vessels. This causes the veins just below the skin surface to twist and bulge. You may notice pain after long periods of seating or standing or random itching during the day. Varicose veins occur more often in the lower parts of legs and ankles. One of the clearest signs that your body is not getting the right amount of nutrients is the effect on hair and nails. The hair can become dry, begin to thin and create spots on the scalp. Your skin can become much drier and starts itching. The nails tend to be much weaker and can break easily. Problems with poor blood circulation are usually treated with medication. However, it is always better to take a more natural approach if the condition is allowing it. Official medicine approach can be effective but it has numerous side effects and in most cases, these methods don’t treat the real cause. The change of lifestyle will greatly help in most of the cases. There are four great herbs which have been proven to have a positive effect on poor blood circulation: These herbs are cayenne, garlic, Ginkgo Biloba, and ginger. It’s necessary to eat more fruits and vegetables and include more fibre-rich foods to your diet. Keeping yourself hydrated is a must, so increase the intake of fresh water to 8 glasses per day. Try to avoid coffee and tea which contain caffeine and theine. Alcohol is a big enemy to this condition. Try to avoid it. Other treatments and holistic approach include the acupuncture and acupressure. There are also hydrotherapies which have great results. Some people find yoga and stretching exercises very helpful.